The plan for the weekend was to have a relaxed weekeng cruising in the Solent, and the trip certainly lived up to the plan! We started in Hamble Point marina on Friday night. 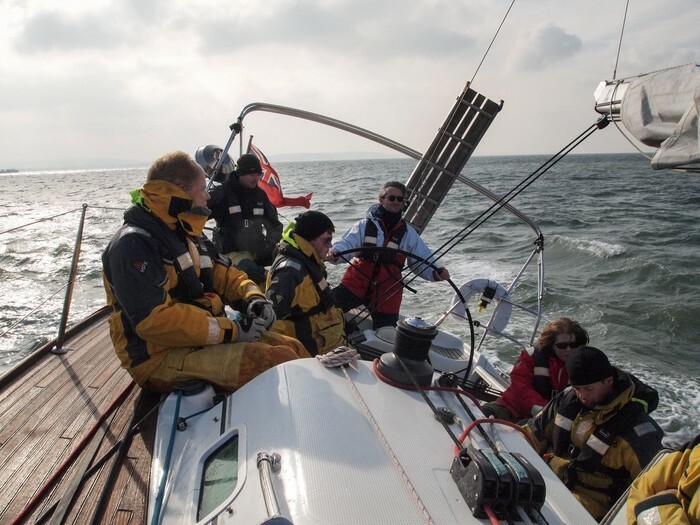 Once the whole crew had arrived, we motored across to Cowes, which made for quite a late night but gave everyone a taste of being out on the water in the dark. On Saturday we got moving by about 9:30 and sailed east in a gentle force 3 to Langstone Harbour for lunch. Skylark moves really nicely in light winds – we were going about 8 knots over the ground with a bit of help from the tide! Inside the entrance to Langstone we found a lot of mooring buoys so it was easy to pick one up for lunch. We discovered on the way out that the tide runs quite strongly in the harbour entrance, as we crept out against the last of the flood making only a knot or two over the ground. Sailing with the tide again, we went west to Lymington for the night. Broad reaching in flat water in a force 3, it felt like a good chance to try out the spinnaker, even with a relatively inexperienced crew. Taking our time about it, we managed to set everything up properly and got the kite up smoothly, and then found ourselves making about 6 knots through the water in only 4 knots of apparent wind! We enjoyed a nice sunset and made very good time, arriving in Lymington at dusk. Thanks to advice from Hywel we went up past all of the Lymington marinas to find the town quay, where berths can be had much cheaper (or free if there's no one to collect any money, as we found!) It's also much nearer the pub :-) We did have to moor up on the outside of a four-boat raft, though. We then enjoyed a nice relaxed evening - a hearty dinner on the boat, then the pub for a drink or two. On the way out of Lymington on Sunday morning we saw the true scale of the marinas and moorings – I'm sure it must have more boats than people! We were leaving just as a racing fleet was coming back in, which made things a bit more interesting in the narrow channel getting out. The morning brought us quite different conditions – a beat into an easterly force 5 with slight to moderate waves. Skylark handled it very nicely though, using the second reef and then adjusting the amount of jib to keep to a comfortable angle of heel. We joined up with Richard Brooksby in Tammy Norie off Beaulieu, then met him for lunch in Cowes and had the chance to have a look round his boat, including a demonstration of how amazingly easy it is to reef a junk rig. To finish, we made our way back over to the Hamble, which was a nice reminder of the way you can always find sheltered water in the Solent – as we neared the eastern shore of Southampton Water the waves flattened and we enjoyed some very nice sailing in calm water. With a bit of time to spare at this point, we sailed a bit past the Hamble, then spent a little while testing how well Skylark can heave to (answer: quite well once you get to the right angle and speed, but getting there takes a bit of care!) and finally headed back to Hamble Point to finish. 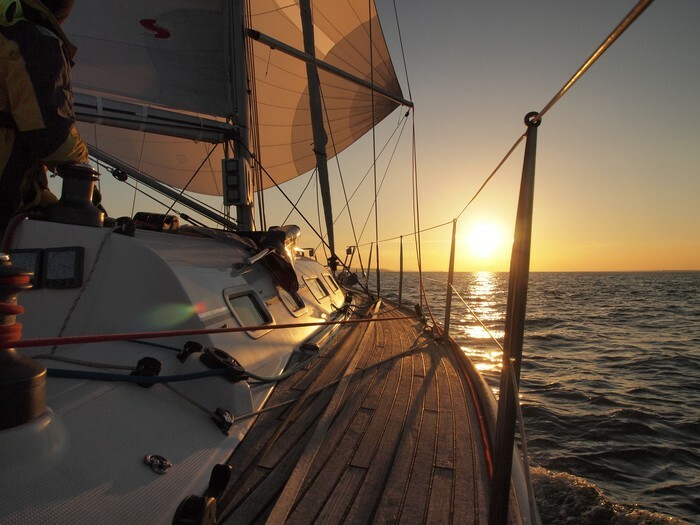 So, a very nice trip overall with a good range of different sailing conditions. 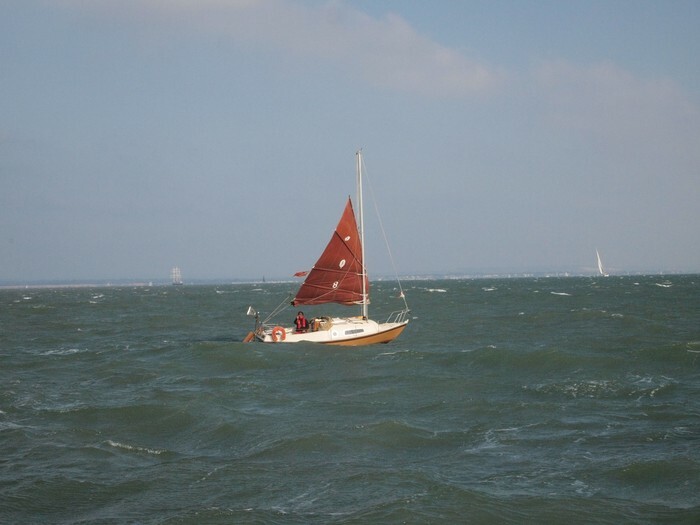 Skylark is pretty fast, going mostly with the tides we were rarely moving slower than 8 knots over the ground. She's also in pretty good condition (those who used the heads during the summer will definitely appreciate the improvement!) and with a third reefing point now installed in the mainsail she should be well equipped for UK sailing. You just have to remember the sails are big and powerful so reef early!